With its beautiful, varied scenery and rich history, Normandy has much to offer visitors. Normandy boasts one of France's most famous tourist sights, Mont Saint-Michel, as well as impressive castles, splendid churches, and picturesque ancient towns such as Rouen. The seaside resorts of Honfleur and Deauville are popular during summer, and the natural beauty of the region's coastline, woodlands, and meadows is an attraction in itself. Along the Channel coast, dramatic limestone cliffs drop off into the ocean, while Lower Normandy is characterized by verdant, peaceful valleys. An idyllic pastoral area known as the "Suisse Normande" ("Norman Switzerland") attracts nature lovers and outdoor sport enthusiasts. For WWII history buffs, visiting Normandy is essential. During the Second World War, Normandy was heavily affected by the German Occupation and was the site of Allied landings in 1944. Tourists can visit the military cemeteries; memorial museums; and the D-Day landing beaches, including Omaha Beach and Arromanches Beach. Learn more with our list of top attractions and places to visit in Normandy. An important medieval pilgrimage destination, Mont-Saint-Michel is one of the top-rated sights in France. Designated a UNESCO World Heritage Site, the Abbey of Saint-Michel has a mythical quality, soaring more than 100 meters above the sea. The Gothic spires seem to reach towards heaven as the site beckons visitors to cross the foreboding Bay of Saint-Michel. During low tide, it's possible to complete a "traditional crossing" (a guided walk or a pilgrimage) to reach Mont Saint-Michel. During high tide, Mont Saint-Michel becomes an island only accessible by one road. The highlight of a visit is the Abbey Church, reached by climbing a 200-meter pedestrian path and then 350 steps to the highest point of Mont Saint-Michel. Built in the 12th century, the majestic and awe-inspiring Abbey has a serene Romanesque sanctuary and a glorious Gothic choir. From the Abbey's terrace on the West facade are breathtaking panoramic views. Wandering around the old town of Rouen, visitors will enjoy the historical ambience found in the winding cobblestone lanes, which are lined with maisons à colombages (half-timbered houses). Gothic churches are found at every turn, and many are gems of medieval architectural achievement. The town's impressive cathedral was depicted by Claude Monet in a series of paintings that show the intricate details of the cathedral's facade at different times of day. Another noteworthy monument in Rouen is the Gros-Horloge clock tower in the center of town. Those who appreciate culture should visit the Beaux Arts Museum with its exceptional fine arts collection. Rouen is also well known as the location where Joan of Arc was brought to trial. Tourists can see the tower where this courageous young woman stood before her judges and the spot where she was martyred. She later became a saint, and now there is a contemporary church dedicated to her invincible spirit. With its picturesque old harbor on the Seine estuary, Honfleur is one of the most charming towns in Europe. About 25 kilometers away from Le Havre, the town has atmospheric cobblestone streets and many old half-timbered houses. This old seafaring port was where travelers embarked on voyages to Canada in the 16th century. On the north side of the harbor is the 16th-century Lieutenance building, the old governor's house, built on the remains of the town's ancient walls. One of Honfleur's most noteworthy attractions, the Musée de la Marine (Maritime Museum), is housed in the former Eglise Saint-Etienne, which was built between the 14th and 15th centuries. The Maritime Museum tells the history of seafaring, fishing, and shipbuilding in Honfleur. A top attraction for lovers of Impressionist art, the Musée Eugène Boudin (at Place Erik Satie) features an extensive collection of 200 works. Boudin's paintings represent more than half of the collection; the rest includes pieces by other Impressionist artists such as Gustave Courbet, Eugène Isabey, and Paul Huet who painted scenes of the Normandy coastline. The museum also has an annex devoted to religious art, located in the freestanding belfry of the Eglise Sainte-Catherine. An interesting tourist attraction in itself, this Late Gothic church was built by local shipwrights after the Hundred Years' War. In Lower Normandy near the English Channel, Caen played a critical role during the Nazi Occupation of World War Two. Caen is an excellent starting point for a tour of the Normandy D-Day Beaches and Memorials. Three-quarters of the town was destroyed during the Allied landings in June and July of 1944 (although its historic churches survived almost entirely unscathed). Created as a tribute to Caen's suffering during the war, the Mémorial de Caen (Caen Memorial Museum) tells the story of the Second World War, the D-Day Landings, and the Battle of Normandy. Beneath the Caen Memorial Museum is the site of General Richter's Headquarters, which was a command post during the German Occupation. The Mémorial de Caen is also the Center for History and Peace in Normandy, which aims to educate the public and promote the concept of reconciliation. The center also offers guided tours of the D-Day Landing beaches, led by knowledgeable historians, and hosts events such as temporary art exhibits and a Human Rights Competition. The town of Bayeaux is best known for the Bayeux Tapestry, on display at the Bayeux Museum (13 bis Rue de Nesmond). An 11th-century masterpiece of medieval art, the Bayeux Tapestry is actually a work of embroidery, woven from wool yarn in 10 different shades. The 70-meter-long piece depicts the story of the conquest of England in 1066 by the Duke of Normandy (William the Conqueror), through the Battle of Hastings. The Bayeux Tapestry is also known as the "Toile de la Conquête" ("Cloth of Conquest") and the "Tapisserie de la Reine Mathilde" ("Queen Matilda's Tapestry" in reference to William's wife). Because of its cultural value as an artifact of historical documentation, the Bayeux Tapestry has been inscribed with a UNESCO "Mémoire du Monde" designation. Rendered in exquisite detail, the Bayeux Tapestry depicts 58 different scenes (in a format similar to a comic strip) in incredible detail, including 623 figures, 759 animals, and 37 buildings and ships, along with a running commentary in Latin. Visitors should also take time to discover the old town of Bayeux — an enchanting medieval world of half-timbered houses, elegant mansions, and stately townhouses. At the center of the old town is the well-preserved Cathédrale Notre-Dame, one of the finest examples of a Norman Gothic church. The cathedral was built over several centuries (from the 11th century to the 15th century), and as a result, blends Romanesque with Gothic architectural elements, including Early Gothic and Flamboyant Gothic styles. Omaha Beach extends for more than 10 kilometers between Port-en-Bessin past Vierville-sur-Mer and Colleville-sur-Mer to the mouth of the Vire River, a dramatic coastline along the English Channel made difficult to access by the sheer cliffs that rise 30 meters above the sea. The largest and most famous of the five Normandy D-Day Landing Beaches, Omaha Beach is where the American 1st and 29th Infantry Divisions landed, along with other U.S., British, French, and Canadian troops on June 6th, 1944, which marked the beginning of Operation Overlord (also known as the "Battle of Normandy"). Visiting this site provides a chilling impression of the deadly battle, one of the bloodiest scenes of fighting during the D-Day Invasion, that took place here. Remnants of German bunkers and military piers can still be seen along the cliff-fringed coastline. The American Cemetery in Colleville-sur-Mer overlooks Omaha Beach. The cemetery contains more than 9,000 perfectly aligned gravestones, which makes it the biggest American cemetery in Normandy. Near Omaha Beach and the American Cemetery is the Overlord Museum, which chronicles the history of the Allied landings and the liberation of Paris. The museum's collection includes war vehicles, tanks, and guns, as well as soldiers' personal items. Since the 19th century, Deauville has been a premier seaside resort in Normandy and is still considered one of the top beach destinations in France. The seafront features two kilometers of sandy shoreline and a promenade (boardwalk) for seaside strolls. Lifeguards are on duty daily from June through September. Fitting of a glamorous beach destination, amenities abound such as places to rent parasols, lounge chairs, and old-fashioned striped cabanas. There are also more things to do than just relax and lounge by the sea. Holiday-goers can take a break from sunbathing at the beach to browse the fashionable boutiques, get a spa treatment, or enjoy a gourmet meal at one of the many stylish restaurants. Deauville also draws many nature lovers and outdoor sports enthusiasts who come for sailing events, golfing at one of the four courses, and equestrian competitions. Deauville lives up to its reputation as an internationally renowned resort with its array of prestigious events, including regattas hosted by the Deauville Yacht Club, the International Polo Championship held at Deauville's modern nine-hectare equestrian complex, the Deauville American Film Festival, and the sailing competition during Deauville International Week. 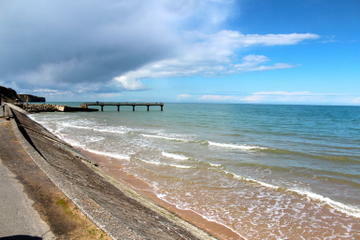 The area around Deauville gives visitors a chance to admire the seaside beauty of Normandy. For those who would like to take a driving tour of the Normandy coastline, one especially appealing route is a portion of the Côte Fleurie ("Coast of Flowers") from the Deauville to Cabourg (20 kilometers). Prized for its charming pastoral scenery, fabulous ocean views, and seafront villas surrounded by flower-filled gardens, the Côte Fleurie extends from Honfleur for about 45 kilometers to Merville-Franceville. For lovers of Impressionist art, Monet's Garden is an exciting place to visit. Claude Monet's former residence in Giverny is a lovely country house about one hours' drive from Rouen. It's also one of the top day trips from Paris. Visitors will enjoy seeing the property's gardens, which inspired so many of Monet's paintings. In front of the house is the "Clos Normand" garden, which was created by Claude Monet. From springtime through autumn, this garden dazzles with a profusion of colorful blossoms, including daffodils, pansies, tulips, irises, peonies, daisies, roses, poppies, hollyhocks, and dahlias, planted in a natural way so that they look like wildflowers. On the other side of the property is the Water Garden featuring a Japanese bridge and waterlily pond surrounded by weeping willow trees. The water garden was depicted in Monet's "Water Lilies" series of paintings. Monet devoted many years to painting different aspects of his garden; he captured the natural beauty of the place through his use of delicate brushstrokes and subtle color schemes. Even the smallest details of the garden, from the varying reflections in the water to the way sunlight filtered onto his beds of irises, became the focus of Monet's artwork. In the town of Giverny, the Musée des Impressionnismes Giverny (Giverny Museum of Impressionism) presents a broad collection of paintings representing different types of Impressionism, organized in three separate galleries. The Impression Museum is surrounded by a meadow and also has a lovely garden with landscaping reminiscent of Monet's Garden. Nearby in the town of Vernon (about a 10-minute drive), the Musée de Vernon showcases several masterpieces painted by Monet, along with works by other Impressionist artists (who belonged to the Giverny colony of painters) and an eclectic collection that includes historical and archaeological objects, animal art, and humorous drawings. A favorite beach vacation destination on the Côte d'Albâtre, Fécamp is one of the best places to visit in Normandy for a relaxing holiday break. Established in 1832, Fécamp was one of France's first seaside resorts, and it attracted a cultured and high-society crowd. Today, sunbathers and socialites alike enjoy the refreshing ocean scenery. The writer Guy de Maupassant lived in Fécamp for some time, and some of his stories are set in the town. Apart from the fishing harbor, the main tourist attraction here is the old abbey church of Sainte-Trinité, originally built in the 12th and 13th centuries. The interior is remarkably spacious with an exquisite choir and Renaissance altar. The medieval pilgrimage chapel, Notre-Dame-du-Salut, stands on a steep chalk cliff to the north of town. About 11 kilometers away is the village of Valmont with an ancient castle and the ruins of a 12th-century abbey. The seaside resort of Étretat is nestled at the foot of white limestone cliffs on Normandy's Côte d'Albâtre coastline. The cliffs reach 90 meters in height, and from the top are sensational panoramic views. The scenery of Étretat appealed to Claude Monet who spent a winter here in 1868 while capturing the dramatic landscapes and glistening waterfront in his paintings. The beaches of Étretat delight sunbathers during the summer, and the ocean is a source of livelihood for fishermen who catch fresh seafood that is widely used in the local cuisine. Étretat also has many attractive Belle Epoque villas, the most well-known is the Villa Orphée. The Villa La Guillette was built for the author Guy de Maupassant. The name of Suisse Normande (Norman Switzerland) is given to the stretch of countryside in the Orne Valley of Lower Normandy, extending between Thury-Harcourt (south of Caen) in the north, Flers-de-l'Orne in the south, and Falaise in the east. An idyllic piece of rural landscape, the Suisse Normande is characterized by its gently rolling hills, densely wooded forests, wide open space, steep gorges, and pristine lakes. The winding river, rocky bluffs along its banks, and the intricate patchwork of hedges give the scenery a particular charm. The most striking features are the Rocher d'Oëtre, in the hilliest part of the area, and the superb view from above the gorges of the Rouvre River. Other scenic areas include the Vère and Noireau valleys and the stretch of the Orne Valley between Thury-Harcourt and Pont-d'Ouilly. This area includes two regional parks: the Parc Naturel Régional Normandie-Maine and the Parc Naturel Régional du Perche; both have well-maintained trails for nature walks and hikes. The Naturel Régional Normandie-Maine also offers opportunities to go canoeing or kayaking. The most spectacular château in Normandy, the Château de Fontaine-Henry enjoys a peaceful setting in the lush Mue Valley of Lower Normandy (about 14 kilometers from Caen). The château was built in the beginning of the 13th century, and the family who owns Château de Fontaine-Henry traces their ancestry to the year 1200. During the Renaissance, the building was enhanced with splendid embellishments and is a notable example of Gothic and Renaissance architecture with an imposing stone facade. The lavish interior is filled with gorgeous furniture and exceptional paintings, including works by Titian, Correggio, Rubens, Mignard, and Rigaud. There is also a separate 13th-century chapel, which was renovated in the 16th century. Surrounded by forests, the château has an expansive parkland with walking paths and traditional games for visitors to enjoy. Within the park are three distinct gardens: the Jardin Notre-Dame, a medieval garden planted with vegetables and medicinal herbs; the Hortus Conclusus, an enclosed garden designed for religious meditation and spiritual reflection; and the Gerbe du Parnasse, a garden with a theme of Greek mythology. Guillaume le Conquérant (William the Conqueror) built this castle in 1060 when he was the King of England. The Château de Caen is one of the largest medieval monuments in Europe and a quintessential symbol of Caen's heritage. During the Middle Ages, the château was a royal fortress, and it later served as an English stronghold during the Hundred Years' War and as army barracks for an infantry regiment during the Second World War. Both the Musée de Normandie and the Musée des Beaux-Arts de Caen (Museum of Fine Arts) are housed in the castle. The Normandy Museum provides an overview of the region's culture and history, including the history of the castle. The Fine Arts Museum is considered one of the finest art museums in France. The collection focuses on European paintings (French, Italian, Flemish, and Dutch) of the 16th and 17th centuries. The museum's treasures include masterpieces by Poussin, Rubens, Veronese, and Brueghel among others. The museum's collection also extends to the 19th century with wonderful Impressionist pieces, such as paintings by Monet, Boudin, Corot, and Courbet. Bayeux has a British World War II cemetery as well as the Memorial Museum of the Battle of Normandy. 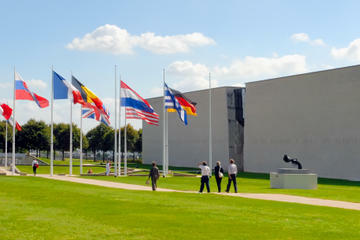 This museum explains Normandy's involvement during World War Two by outlining an overview of the wartime events. With 2,300-square-meters of exhibition space, the museum does an outstanding job of recounting the Normandy Campaign, from the advancement of the Allied troops to D-Day on June 6th, 1944 and the liberation of Paris on August 25th, 1944. The museum has an auditorium that shows the film "Normandy 44, a Decisive Victory in the West," based on archival documents. Created by a World War II historian, the film explains the major operations involved in the Battle of Normandy. The museum also displays military equipment used during fighting on the Landing beaches, such as bulldozers, jeeps, and guns. The main aim of the museum is to share WWII history with the public and to serve as a place of remembrance, while honoring the memory of fallen civilians and soldiers. Near Omaha Beach, the D-Day landing beach (Gold Beach) of Arromanches was successfully captured by the British 50th Northumberland Division on June 6th, 1944 in a surprise offensive. Because Arromanches does not have a natural harbor, the Allied forces had installed artificial harbors, known as the Mulberry Harbors. The Arromanches D-Day Museum overlooks the beach, close to the spot where the harbor was constructed. Remnants of the artificial harbor can still be seen on the sandy shore and in the waters near Arromanches. The museum illustrates the remarkable logistics and technical aspects of "Operation Mulberry," which involved the building of the Mulberry Harbors, one at Gold Beach and the other at Omaha Beach. Educational content describes the logistics required to create and use the Mulberry Harbors, while working models demonstrate how the artificial ports operated. Visitors can also watch a documentary film featuring World War II archival footage. Near the museum are many cafés and shops on the bustling Place du 6 Juin square. Historically a seafaring port, Dieppe became France's most stylish seaside resort in 1924 when the Duchess of Berry came here to enjoy the ocean's fresh air and health benefits. The Duchess transformed the town (by having a ballroom and theater built) and made it a glamorous beach destination. Today, visitors still come to enjoy Dieppe's beautiful broad seafront, an expansive space that includes a pebbly beach, promenade, children's playground, miniature golf course, and facilities for fishing and sailing. Unique to Dieppe, the seafront includes well-manicured lawns. In early September, an International Kite Festival is held on Dieppe's seafront lawns. Above the beach, on a craggy cliff town, is the Château-Musée de Dieppe, which contains a collection of archaeological and historical exhibits, as well as French paintings from the 19th and 20th centuries. Northwest of the castle, the Boulevard de la Mer offers stunning sea views. In the center of the town is the pleasant Place du Puits-Salé and nearby are many cafés and pastry shops. Dieppe has two important churches: the Baroque Eglise Saint-Rémy, built in the 16th and 17th centuries, and the Eglise Saint-Jacques, a striking Gothic church with ornately sculpted doorways and a richly decorated interior. With today's recreational ambience, it's hard to imagine that Dieppe was the site of the a tragic and pivotal WWII event. During a disastrous Allied Landing on August 19th, 1942, the Allied forces (mainly Canadian) attempted a Raid on Dieppe, but the offensive was met by the well-defended German army with unexpectedly strong reinforcements. The Allied casualties were severe with over 900 Canadians soldiers killed in less than nine hours, plus thousands wounded or taken as prisoners of war. There are a number of memorials in Dieppe honoring the Canadian troops who landed here as part of the raid that took place in 1942. About a one-hour drive south of Rouen, the town of Evreux is worth a detour. The main tourist attraction is the Cathédrale Notre-Dame founded in the 11th century. The cathedral's monumental nave still has Romanesque-era arches, although it was rebuilt in the 13th century in Gothic style. Illuminating the sanctuary are glorious stained-glass windows, created between the 13th and 16th centuries and considered masterpieces. Evreux also has a noteworthy 15th-century Palais Episcopal, which now houses the Musée d'Art, Histoire et Archéologie displaying a diverse collection of ancient artifacts; historical objects; and European paintings from the 17th, 18th, and 19th centuries. Other noteworthy sites in Evreux include the Tour de l'Horloge (Clock Tower), which dates from 1490, and the former Abbaye de Saint-Taurin, which contains the 13th-century reliquary of Saint Taurin, an exemplary piece of goldsmith's work. Although less upscale than Deauville — the neighboring "Parisian Riviera" resort (just two kilometers away), Trouville has a similar ambience. Like Deauville, Trouville was a fashionable seaside resort in the 19th century. The broad sandy beach was once known as the "Queen of Beaches" and still attracts many visitors. Another tourist draw is the boating harbor for recreational sailing. One highly recommended excursion from Trouville is a drive along the Corniche Normande, which skirts the coast high above the sea. This scenic drive offers extensive views all the way to Honfleur. Built around the estuary of the Seine River, Le Havre is France's largest port after Marseille. From 1840 to 1926, Claude Monet lived in Le Havre and painted many masterpieces here. Le Havre suffered much damage during the Second World War and was almost completely rebuilt with many buildings designed by the architect Auguste Perret. The modern city center offers interesting examples of 20th-century architecture, such as the Place de l'Hôtel-de-Ville with its functional tower blocks. One of the prettiest of the villages that dot Normandy's rural landscape, Le Bec-Hellouin is listed as one of the Plus Beaux Villages de France (Most Beautiful Villages of France). This little country village is tucked away in a peaceful valley and has plenty of open green space with leafy trees. Brimming with old-world charm, Le Bec-Hellouin has quaint flower-bedecked half-timbered houses clustered around an old church, the Eglise Saint-André. Tourists will also appreciate the village's selection of small inviting hotels and casual restaurants. The village is renowned for its abbey, the Abbaye Notre-Dame du Bec-Hellouin that dates to the 11th century and was a center of Christian study during the Middle Ages. Although the abbey was badly damaged in 1417 during the Hundred Years' War, several of the older buildings remain intact, including the 15th-century Saint-Nicolas Tower, which presides over the village, and the 17th-century cloister, a tranquil environment for prayer and mediation. The abbey's other buildings feature a simple Regency style with unostentatious facades and harmonious classical proportions. The Abbaye Notre-Dame du Bec-Hellouin is still a working monastery run by a community of Benedictine monks. Besides fulfilling their religious obligations, the monks produce handcrafted ceramics and provide guided tours of the abbey. Another historic abbey is found 35 kilometers from Le Bec-Hellouin in Jumièges. During the Middle Ages, the Abbey of Jumièges was the most magnificent religious monument in Normandy. Although the abbey was nearly destroyed during the Hundred Years' War, the ruins reveal its prestigious past. Built in the 11th century, the abbey became an unsurpassed center of learning under the rule of William the Conqueror. In the 13th century, the church was enhanced in marvelous Gothic style, reflecting the grandeur of the abbey and its immense wealth. Barfleur is a characteristic Norman fishing village with handsome granite-stone houses lined up along the harbor. The town's picture-perfect quality has earned it a place among the Plus Beaux Villages de France. Barfleur was a principal seafaring port for the Anglo-Norman Kingdom during the time of William the Conqueror because of its advantageous position on the English Channel. Today, Barfleur is still a busy fishing port, with small boats unloading fresh catches daily at the quays. The town's traditional restaurants offer a chance to sample the tempting cuisine, especially for those who love seafood. Barfleur is also a seaside recreational destination with nearby beaches and coastal paths for taking nature walks.